Republicans insist on using the power of the purse to defund a Democratic priority. Democrats stand resolute in resisting the spending cut. A government shutdown looms large, if no agreement is reached. We at Democrazy covered the government shutdown in 2013 over Obamacare, and the near government shutdown in March over Obama's immigration orders. In July, Planned Parenthood videos came to light that showed several employees appearing to encourage women to have abortions to use the fetuses' tissue for scientific research. Appalled, some Republicans insisted on defunding Planned Parenthood over the videos. They believed that the money should go to other health care providers. Democrats, on the other hand, stood resolutely behind Planned Parenthood, arguing that Planned Parenthood provides many services besides abortion. They noted that the videos were spliced together, quoting the employees out of context. A government shutdown cast a long shadow over Congress; neither side seemed likely to blink. Until, a surprise occurred. 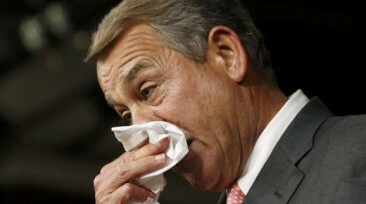 In an ironic twist, the very Tea Party movement that brought Boehner to power in 2010 is the one that toppled him now. Boehner had battled Tea Party Republicans for years. They believed that Boehner compromised too much, and was too willing to cede ground to Democrats. They threatened to remove him from the speakership unless he supported shutting down the government over Planned Parenthood. Boehner, a pragmatic conservative, refused to hold government funding hostage over Planned Parenthood, citing how badly the GOP fared in the aftermath of the 2013 shutdown. After his resignation, Boehner was free to move a bipartisan bill keeping the government open for two months. Boehner's resignation ended the immediate threat of a shutdown. Some conservatives are looking forward to the December deadline as another potential funding showdown over Planned Parenthood. We at Democrazy will keep you posted on how round four ends.